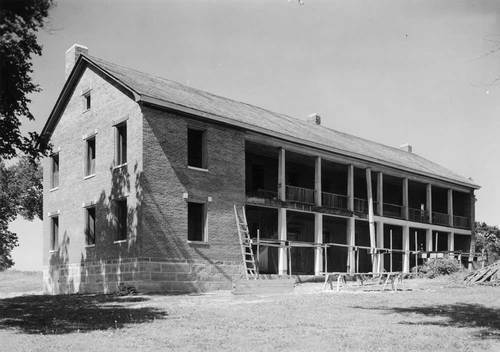 A view showing reconstruction work at the Shawnee Methodist Mission, North Building, Fairway, Kansas. This structure was used as a residence by Rev. Thomas Johnson, his family, mission teachers, and as a dormitory for Shawnee Indian girls. Also, this building housed the executive office of the Kansas Territory in 1855. The photograph was taken as part of the Historic American Building Survey for the Library of Congress.